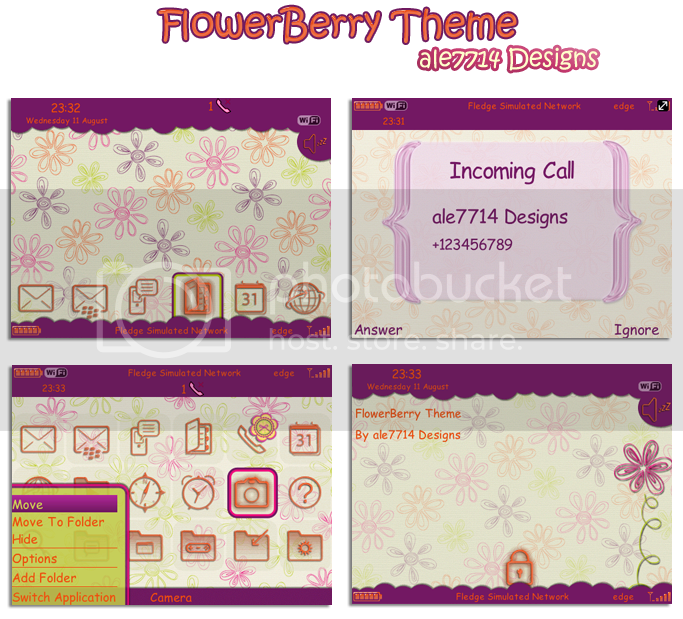 FlowerBerry is a fresh, colorful, playful and girly theme. It's fully customized and the high quality wallpapers are specially designed for theme to make sure easy reading and using. FlowerBerry has bright orange icons that gives a very fun and feminine touch. Also the menu and dialog pop-up has a semitransparent and colorful look. FlowerBerry is the perfect theme to give a fun and cute look to your BlackBerry. * Bright orange BlackBerry style icons. * Colorful wallpapers full of flowers. * Wallpapers of high quality and edited for improve readability. * The Home screen icons are customizable. * Transitions (Only for OS4.7.1 and above). * All details of the theme have been carefully customized.